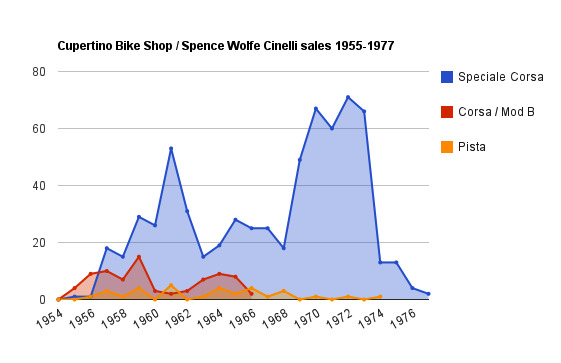 In the USA the largest sellers of Cinelli bikes were Kopp's Cycles, the oldest bicycle shop in America, in Princeton, NJ and the Cupertino Bike Shop of Spence Wolfe in Cupertino, California. 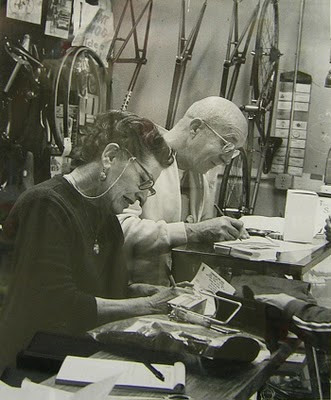 Spence and Lillian Wolfe at their Cupertino Bike Shop. They only dealt in quality lightweights and became West Coast (of U.S.A.) importers for Cinelli frames. Spence was also a bike mechanic of "guru" stature and collaborated with the Phil Wood company on their component designs. Read here about a 1969 Cinelli with "Alpine" Gearing by Spence Wolfe. A 1970 Cinelli ordered through the Cupertino Bike shop here. I invite you to contribute by sending in photographs of your Cinelli bike, illustrations, personal stories, and articles about Cinelli bikes and components. I wish we could identify how many of which sizes were sold. Very interesting. This gives a hint about how many Cinellis that where sold in the US. Does anyone have any records from Kopps or any other shop in US and Canada? What happened 1974? Did the boom collapse, or did another bike brand sell more units? Thanks! I have added your graph to the body of the story. paint job (considerably nicer than the original) free of charge!